Keep summer alive by climbing aboard the Dead Man’s Fingers Rum Canal Boat (now until 31st October) to sip punchy rum cocktails while cruising the capital’s canals. 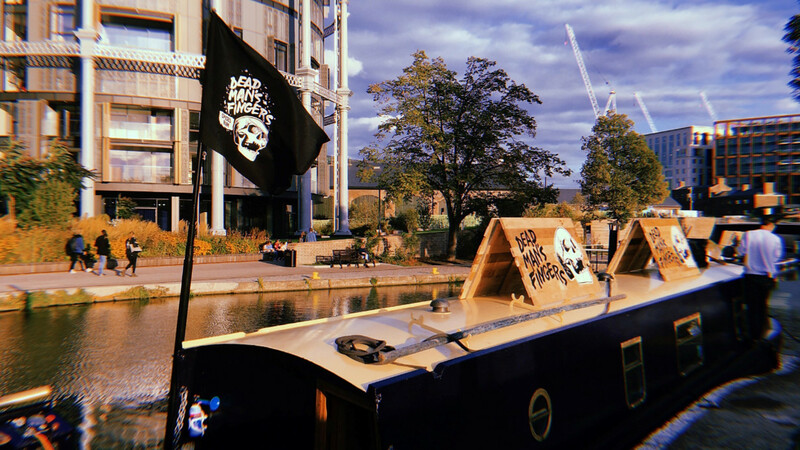 Moored at Granary Square, Kings Cross, the Dead Man’s Fingers Rum Boat sets sail daily at 7 pm, laden with Cornish rum and heaps of maverick spirit. Dead Man’s Fingers, the Cornish rum brand that brought the innovative ‘SkullCuts’ barbers to Shoreditch last month, has teamed up with Ladies & Gentlemen bar to run the hour-long tours for cosy cocktail cruises. The boat holds a maximum motley crew of 12 persons and is fully enclosed to suit any weather and boasts a roaring coal fire aboard to keep all guests toasty. Guests will be greeted at Granary Square, Kings Cross and travel eastwards past the iconic Guardian Building. The rum cruise will sail under Caledonian Road before entering the Victorian-designed Islington Tunnel and into leafy Islington, a picturesque scene that hasn’t changed since the turn of the century – all this with a Dead Man’s Fingers cocktail in hand. To help landlubbers find their sea legs the first drink is on the house – sorry, boat – then guests can choose from a selection of tasty cocktails made with Dead Man’s Fingers Spiced Rum, Coffee Rum and Coconut Rum, from the onboard bar and talented team from Ladies & Gents. The Dead Man’s Fingers Boat Tour offers guests the chance to explore parts of London they never knew existed, while raising a tot of true Cornish spirit. The trip is perfect on a warm Autumnal evening – and especially if chills are in the air with the onboard wood burner that guests can cosy up to. Tickets for the Dead Man’s Fingers Boat Tour cost just £15 per person and can be bought at www.designmynight.com. The Dead Man’s Fingers Rum Canal Boat is ideal for a night out with friends or an office party with a twist. Dead Man’s Fingers is breaking the rum mould by bringing a twist to Caribbean rum, using flavours and ingredients from the local Cornish area, such as saffron cake and the infamous Petro Ximinez ice cream from the Rum & Crab Shack in St. Ives. The complete range of versatile and punchy Dead Man’s Fingers Spiced Rum is available from Amazon, £22 for 70cl, with the original Spiced Rum also available in ASDA stores nationwide, currently on offer for £18 and the Coffee and Spiced Rums are also available from Ocado, priced £22.